The truth is that 95% of unique visitors do not purchase on the first visit to your website! They browse the web again, looking at competitors and researching the product or service offered. This is all part of the consumer buying process. 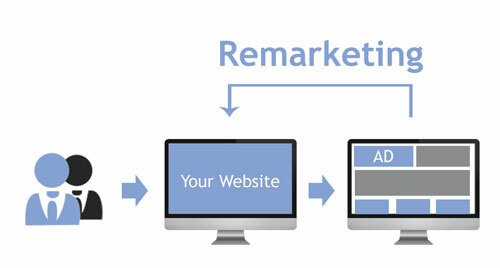 Remarketing allows you to show ads to people who have previously visited your website as they browse other websites. It gives the impression that you are everywhere and keeps you at the forefront of the customers mind whilst they are undecided on their purchase. You can serve different adverts for different locations, times since visit, different pages visited or for the search terms that they used to find your business in the first place. Re target people who have abandoned their order on your website before it completed – giving them the opportunity to come back and complete the purchase. Refine your advert to follow up on the products and/or services they were looking at on your website. It could be a special offer discount or other incentive. Re-target the people who have purchased off you before, they are far easier to sell to again. Special promotional offers can be highly effective. Remarketing is something that can also be used when someone has viewed your social media accounts and those social media accounts can also be used to display adverts allowing the whole online interaction sequence to run in complete synergy. The extent and complexity of what can be undertaken is considerable, therefore we offer a free consultation to fully understand what would work best for your business.